On Saturday, March 30, Dr. George Wright, noted author and incoming Visiting Professor of History at the University of Kentucky, sat down for an online conversation with Sharyn Mitchell, Research Services Specialist at Berea College Library, Dr. Kathryn Engle, sociologist & sister KFTCer, and myself. The interactive webinar was partially funded by ARTWORKS, a program of the National Endowment for the Arts, and hosted by the University of Kentucky Appalachian Center & Appalachian Studies Program with support from Berea College Special Collections & Archives. The conversation explored Black History and the Black experience in Kentucky. Dr. Wright pointed out that race relations across Kentucky and across our country are constantly evolving. In Kentucky, there have been both positive changes – like the increased number of Black college professors in recent decades – and work still to do in areas ranging from homeownership to representation on juries. Sharyn Mitchell agreed that it is a mixed record, and worried that Black History in Kentucky is being lost. After public school integration, Black teachers were not hired to teach in the mostly-white schools. Now teachers aren’t often taught Black History, so many students of all backgrounds never have the opportunity to learn it. And there are very few Black librarians and archivists in our state. Dr. Wright agreed that it is important for all Kentuckians to learn about Black History, including the painful parts. He discussed how communities all over the state are grappling with that history, specifically the legacy of Confederate statues or sites of lynchings. Mitchell noted lynchings that occurred in Russellville, Frankfort, and Nicholasville. Dr. Wright noted that it is difficult for communities to talk about these things, and that learning and discussing Black History in our state is absolutely needed to move forward. When asked about the main barriers to having these discussions, he pointed out that some media narratives paint white and Black people as completely different from each other, making it hard to start a conversation. Social media exchanges can sometimes make it even more difficult to recognize our common concerns as Kentuckians. Dr. Wright believes it’s important to enter these conversations with good intentions to both hear and be heard. He also suggested that we not wait for moments of heightened division when it is difficult to build trust, but rather incorporate Black culture and history into community events and daily life. This can put us in a better position to have meaningful conversations when difficult issues come up. Mitchell added that it’s important for everyone in the community to have a voice in these discussions. Dr. Wright reminded participants that it’s important to connect the past and the present, look at challenging information and the complexity of history, and to think about what you can learn and bring to the discussion. Many KFTC members are leaning into these conversations, and I’d like to encourage every reader to make a plan to learn more about Black History in your own community and create an intentional conversation about race in your neighborhood or town. There is a great resource to get you started at https://nkaa.uky.edu/nkaa/, and you can reach out to your local organizer if you have ideas or questions. 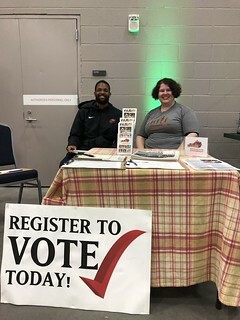 KFTC chapters have a collective goal of registering 575 voters for the primary and there's still time to help out or get yourself registered! The voter registration deadline for the May 21 Primary Election is less than week from now on Monday, April 22. On this year's ballot is the Governor's election and elections for 5 other statewide offices - Secretary of State, Attorney General, Treasurer, Auditor, and Agricultural Commissioner. If you're not registered,or need to update your voter address, get down to your local County Clerk's office or register online. Note that students who are away from home going to school have the right to either use a permanent home address or temporary local address as their voting address. If you're a student, consider being registered where you'll actually be living on May 21. A Congressional subcommittee on Tuesday heard testimony on ways to help Appalachian communities recover from more than a century of coal mining as they build a new and more diverse economy. “We can build a bright future,” Carl Shoupe told committee members. Shoupe, a third generation coal miner from Harlan County, described how residents in the small towns of Benham and Lynch planned and built for their future by creating the Kentucky Coal Mining Museum, the School House Inn and an underground mine tour. The voter registration deadline for the May 21 Primary Election is Monday, April 22. On this year's ballot is the Governor's election and elections for 5 other statewide offices - Secretary of State, Attorney General, Treasurer, Auditor, and Agricultural Commissioner. If you're not registered, or need to update your voter address, get down to your local County Clerk's office or register online. Powerful video from our Rally for Voting Rights sharing the voices of people who have lost the right to vote. This weekend northern Kentucky members helped support students in Fort Thomas do voter registration as part of the March For Our Lives movement.